Sculpture Greyhound set of two in solid bronze. Each greyhound is different, not similar. Measure: A/ L 30 x D 34 x H 89cm. B/ L 30 x D 34 x H 88cm. Sculptures elephants set of two in solid bronze. 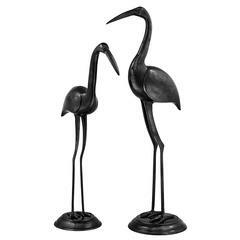 Sculpture heron set of two in bronze antique finish. Measures: Small L 40 x D 20 x H 73 cm. Large: L 43 x D 23 x H 83.5 cm. 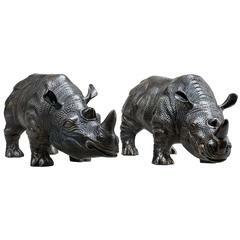 Set of two sculpture Rhinoceros in bronze highlight finish. 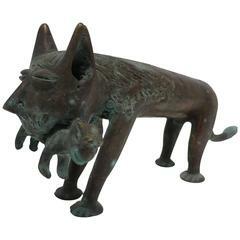 Sculpture Hunter Dogs Set of 2 in solid bronze in antique finish. 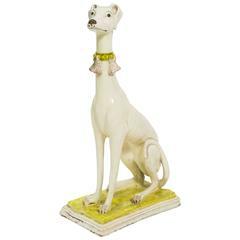 Laying Whippet dog with upright posture molded in composition material. A very substantial unique cat sculpture in solid bronze. Sculpture depicts cat carrying baby cat. Piece measures: 13 in. W x 4.25 in. D x 6 in. H.